Finally!!! THE mod i am was waiting for!!! 00:01:10.754 : [unit] The unit ‘shape14.scania.r.exhaust_r’ of type ‘accessory_addon_data’ has no attribute named ‘ssuitable_for’. 00:01:29.189 : Garage update started. 00:01:29.491 : Garage update finished. 00:01:35.645 : [tobj] Sanitized ‘/model/flare/textures/flare.tobj’ functionality – found 0x88, expected 0x01. 00:03:42.158 : [tobj] Sanitized ‘/vehicle/truck/scania_rcab_2009/interior/v8/textures/plastic_dark.001.tobj’ functionality – found 0x88, expected 0x01. 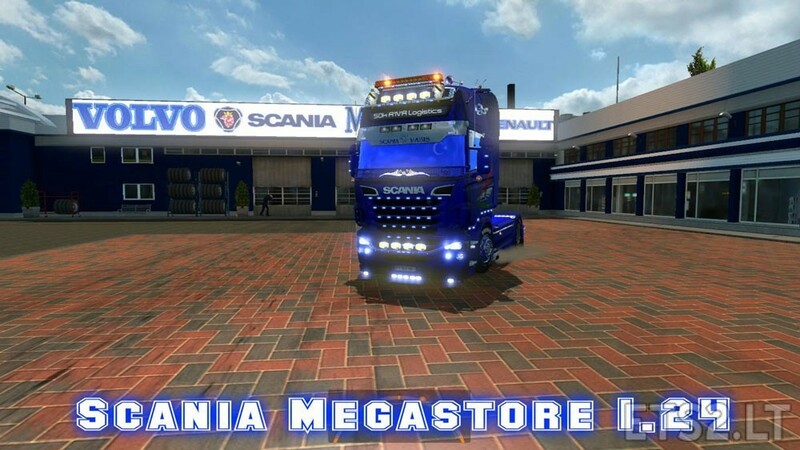 00:03:42.158 : [tobj] Sanitized ‘/vehicle/truck/scania_rcab_2009/interior/v8/textures/leather_3.001.tobj’ functionality – found 0x88, expected 0x01. 00:03:42.159 : [tobj] Sanitized ‘/vehicle/truck/scania_rcab_2009/interior/v8/textures/swheel.tobj’ functionality – found 0x88, expected 0x01. 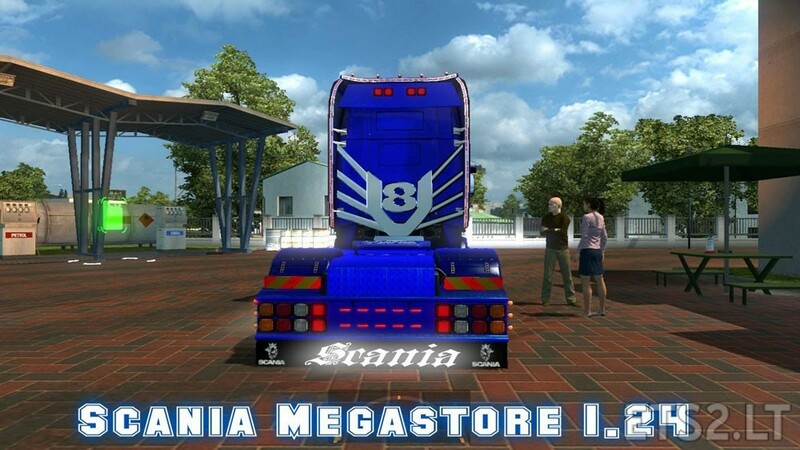 00:03:42.159 : [tobj] Sanitized ‘/vehicle/truck/scania_rcab_2009/interior/v8/textures/vabis_logo.tobj’ functionality – found 0x88, expected 0x01. 00:03:46.043 : [tobj] Sanitized ‘/vehicle/truck/scania_rcab_2009/interior/v8/textures/plast.001.tobj’ functionality – found 0x88, expected 0x01. 00:05:47.000 : [tobj] Sanitized ‘/material/ui/accessory/spoiler.tobj’ functionality – found 0x88, expected 0x01. 00:05:57.541 : [tobj] Sanitized ‘/material/ui/accessory/grill10.tobj’ functionality – found 0x88, expected 0x01. 00:05:58.992 : Model in old format detected ‘/vehicle/truck/upgrade/bottomgrill/scania_rcab_2009/bottomgrill_10.pmg’, please upgrade format to improve load performance! 00:05:59.189 : Mipmapping is not supported for npot texture: ‘/vehicle/truck/upgrade/bottomgrill/scania_rcab_2009/textures/steel.dds’. 00:05:59.194 : Mipmapping is not supported for npot texture: ‘/vehicle/truck/upgrade/bottomgrill/scania_rcab_2009/textures/blinker.dds’. 00:06:01.967 : [tobj] Sanitized ‘/material/ui/accessory/losl12.tobj’ functionality – found 0x88, expected 0x01. 00:06:02.035 : [tobj] Sanitized ‘/material/ui/accessory/b_grill_100.tobj’ functionality – found 0x88, expected 0x01. 00:06:23.959 : Model in old format detected ‘/vehicle/truck/upgrade/bottomgrill/scania_rcab_2009/bottomgrill_12.pmg’, please upgrade format to improve load performance! 00:06:24.123 : Mipmapping is not supported for npot texture: ‘/vehicle/truck/upgrade/bottomgrill/scania_rcab_2009/textures/kelsa.dds’. 00:06:24.124 : Mipmapping is not supported for npot texture: ‘/vehicle/truck/upgrade/bottomgrill/scania_rcab_2009/textures/scania.dds’. 00:06:24.125 : Mipmapping is not supported for npot texture: ‘/vehicle/truck/upgrade/bottomgrill/scania_rcab_2009/textures/g2.dds’. 00:07:31.142 : [tobj] Sanitized ‘/material/ui/accessory/extra.tobj’ functionality – found 0x88, expected 0x01. 00:07:55.618 : [tobj] Sanitized ‘/material/ui/accessory/deflector.tobj’ functionality – found 0x88, expected 0x01. 00:08:16.711 : [tobj] Sanitized ‘/material/ui/accessory/euro.tobj’ functionality – found 0x88, expected 0x01. 00:08:16.760 : [tobj] Sanitized ‘/material/ui/accessory/xl.tobj’ functionality – found 0x88, expected 0x01. 00:08:18.381 : Model in old format detected ‘/vehicle/truck/upgrade/frontgrill/scania_rcab_2009/frontgrill_16.pmg’, please upgrade format to improve load performance! 00:08:18.554 : Mipmapping is not supported for npot texture: ‘/vehicle/truck/upgrade/frontgrill/scania_rcab_2009/textures/b2.dds’. 00:08:18.555 : Mipmapping is not supported for npot texture: ‘/vehicle/truck/upgrade/frontgrill/scania_rcab_2009/textures/g2.dds’. 00:08:18.556 : Mipmapping is not supported for npot texture: ‘/vehicle/truck/upgrade/frontgrill/scania_rcab_2009/textures/b3.dds’. 00:08:21.051 : Model in old format detected ‘/vehicle/truck/upgrade/frontgrill/scania_rcab_2009/frontgrill_17.pmg’, please upgrade format to improve load performance! 00:08:21.224 : Mipmapping is not supported for npot texture: ‘/vehicle/truck/upgrade/frontgrill/scania_rcab_2009/textures/bllight.dds’. 00:08:44.225 : [tobj] Sanitized ‘/material/ui/accessory/roff100.tobj’ functionality – found 0x88, expected 0x01. 00:08:44.226 : [tobj] Sanitized ‘/material/ui/accessory/roff101.tobj’ functionality – found 0x88, expected 0x01. 00:08:51.749 : [tobj] Sanitized ‘/material/ui/accessory/hi.tobj’ functionality – found 0x88, expected 0x01. 00:08:53.073 : Model in old format detected ‘/vehicle/truck/upgrade/roofgrill/scania_rcab_2009/roofgrill_07.pmg’, please upgrade format to improve load performance! 00:08:53.292 : Mipmapping is not supported for npot texture: ‘/vehicle/truck/upgrade/roofgrill/scania_rcab_2009/textures/bblack1.dds’. 00:09:16.209 : [tobj] Sanitized ‘/material/ui/accessory/sidelight1.tobj’ functionality – found 0x88, expected 0x01. 00:10:50.041 : [tobj] Sanitized ‘/material/ui/accessory/griff1.tobj’ functionality – found 0x88, expected 0x01. 00:10:50.042 : [tobj] Sanitized ‘/material/ui/accessory/griff.tobj’ functionality – found 0x88, expected 0x01. 00:11:13.662 : [tobj] Sanitized ‘/material/ui/accessory/schutz.tobj’ functionality – found 0x88, expected 0x01. 00:11:13.663 : [tobj] Sanitized ‘/material/ui/accessory/schutz1.tobj’ functionality – found 0x88, expected 0x01. 00:11:19.219 : [tobj] Sanitized ‘/material/ui/accessory/wunderbaum.tobj’ functionality – found 0x88, expected 0x01. 00:11:58.927 : [tobj] Sanitized ‘/material/ui/accessory/s_glass.tobj’ functionality – found 0x88, expected 0x01. 00:12:33.797 : [tobj] Sanitized ‘/material/ui/accessory/tisch.tobj’ functionality – found 0x88, expected 0x01. 00:12:37.651 : [tobj] Sanitized ‘/material/ui/accessory/euro3.tobj’ functionality – found 0x88, expected 0x01. 00:12:37.653 : [tobj] Sanitized ‘/material/ui/accessory/euro4.tobj’ functionality – found 0x88, expected 0x01. 00:12:37.654 : [tobj] Sanitized ‘/material/ui/accessory/euro5.tobj’ functionality – found 0x88, expected 0x01. 00:12:37.655 : [tobj] Sanitized ‘/material/ui/accessory/klon.tobj’ functionality – found 0x88, expected 0x01. 00:12:37.655 : [tobj] Sanitized ‘/material/ui/accessory/zone2.tobj’ functionality – found 0x88, expected 0x01. 00:12:37.656 : [tobj] Sanitized ‘/material/ui/accessory/zone3.tobj’ functionality – found 0x88, expected 0x01. 00:12:38.700 : [tobj] Sanitized ‘/material/ui/accessory/zone4.tobj’ functionality – found 0x88, expected 0x01. 00:12:56.304 : [tobj] Sanitized ‘/material/ui/accessory/ledlogo_icon1.tobj’ functionality – found 0x88, expected 0x01. 00:12:56.306 : [tobj] Sanitized ‘/material/ui/accessory/ledlogo_icon2.tobj’ functionality – found 0x88, expected 0x01. 00:12:56.307 : [tobj] Sanitized ‘/material/ui/accessory/ledlogo_icon3.tobj’ functionality – found 0x88, expected 0x01. 00:12:56.308 : [tobj] Sanitized ‘/material/ui/accessory/ledlogo_icon4.tobj’ functionality – found 0x88, expected 0x01. 00:12:56.308 : [tobj] Sanitized ‘/material/ui/accessory/sc1.tobj’ functionality – found 0x88, expected 0x01. 00:12:56.309 : [tobj] Sanitized ‘/material/ui/accessory/sc.tobj’ functionality – found 0x88, expected 0x01. 00:13:44.939 : [tobj] Sanitized ‘/material/ui/accessory/c_glass.tobj’ functionality – found 0x88, expected 0x01. 00:14:20.727 : [tobj] Sanitized ‘/material/ui/accessory/dices.tobj’ functionality – found 0x88, expected 0x01. 00:14:24.731 : [tobj] Sanitized ‘/material/ui/accessory/gardinen.tobj’ functionality – found 0x88, expected 0x01. 00:15:19.623 : [tobj] Sanitized ‘/material/ui/accessory/leiste.tobj’ functionality – found 0x88, expected 0x01. 00:15:29.935 : [tobj] Sanitized ‘/material/ui/accessory/led.tobj’ functionality – found 0x88, expected 0x01. 00:15:36.156 : [tobj] Sanitized ‘/vehicle/truck/upgrade/ojakeppi/plastic_schwarz.tobj’ functionality – found 0x88, expected 0x01. 00:16:04.577 : [tobj] Sanitized ‘/material/ui/accessory/backl3.tobj’ functionality – found 0x88, expected 0x01. 00:16:33.066 : Falling back to first variant and look for interior model. Expect problems. 00:16:33.088 : Falling back to first variant and look for interior animated model. Expect problems. 00:18:07.058 : [tobj] Sanitized ‘/material/ui/accessory/ddecals.tobj’ functionality – found 0x88, expected 0x01. 00:18:23.488 : [tobj] Sanitized ‘/material/ui/accessory/losl9.tobj’ functionality – found 0x88, expected 0x01. 00:19:10.579 : Falling back to first variant and look for interior model. Expect problems. 00:19:10.584 : Falling back to first variant and look for interior animated model. Expect problems. 00:19:20.145 : The accessory ‘/def/vehicle/truck/scania.r/sound/interior.sii’ conflicts with the accessory ‘dc13_360.scania.r.engine’, which declares it as default (directly or indirectly)! Check the integrity of the vehicle’s accessory data. Adding item aborted. 00:22:11.186 : Game has been auto-saved.